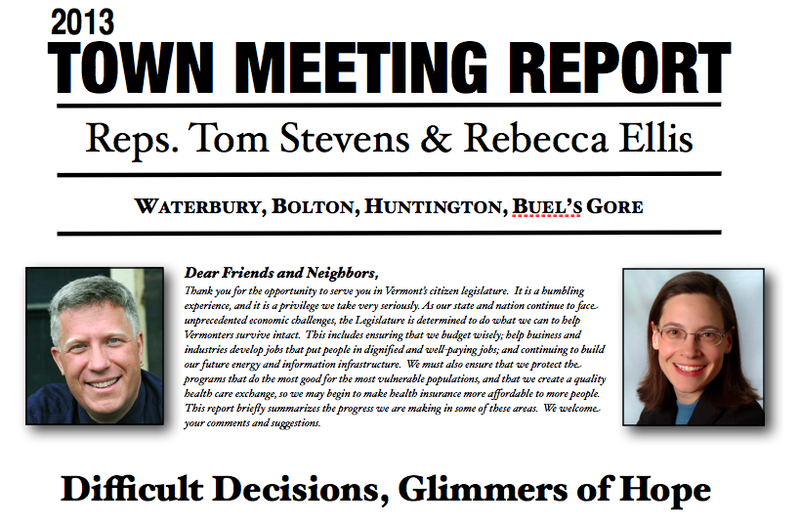 Here is a draft of our 2013 Town Meeting Report. It has been an auspicious beginning to the session, and this report is just a thumbnail sketch of the work we have been able to do thus far. We will be exceedingly busy in the week after our Town Meeting break, as we will reach our crossover date on the Friday after we return. This is the time when all House bills intended for the Senate must be passed out of committee and vice versa. Much of the information in this report reflects the House’s work on these issues. More work will be done in the Senate before it is returned to us and, perhaps, on to the Governor for his signature. If you do not see an issue you are interested addressed within, be assured that we will provide updates on all of them as the session moves along. Filed under Bolton, Buels Gore, General, Housing & Military Affairs, Huntington, Legislation, Policy, Washington-Chittenden, Waterbury.